The Iron Lady – Was She Good For Britain? Ok, this is a blog primarily about the arts but art exists and often reflects the politics that surrounds us! Politicians come and go and it’s not the first time a British Prime Minister has died. However, few undoubtedly make as much of an impact in politics as Baroness Margaret Thatcher who passed away from a stroke last week. The second reason I decided to say something about the former PM is the fact I was born and grow up in Thatcher’s Britain. There will always be a divided view regarding her legacy and whether she was ‘good’ for Britain. The recent celebrations and partying on the streets of Brixton, Bristol and Glasgow would suggest she won’t be missed! With a Grenadian background, I was keen to read the coverage of her death from a Commonwealth perspective, particularly remembering her position on the Apartheid regime in South Africa. Caribbean people, like the rest of the world, have been expressing mixed views of the legacy of former British Prime Minister Margaret Thatcher, who died on 8 April. This ambivalence was summed up by Jamaican-born British MP Diane Abbott, speaking during a special House of Commons tribute session two days later. In fact, there were as many highs and lows in the Iron Lady’s relationship with the Caribbean as in her dealings with bigger nations. After the 1983 US invasion of, or intervention in, Grenada (depending on which Caricom nation’s viewpoint you take), Mrs Thatcher recalled that she received a call in her room at the House of Commons from President Ronald Reagan at a time when she was “not in the sunniest of moods”. The US had not informed the UK, even though the Queen was also Grenada’s head of state, that its troops were to land on Grenadian soil. Caribbean Intelligence© has checked archives in the Reagan Library, now shared with the Margaret Thatcher Foundation, which indicate that Mrs Thatcher took President Reagan’s phone apology for not letting her know in advance with relatively good grace. President Reagan explained that the Grenadian landings had been “going beautifully” and that the two airfields and the medical school had been secured. He went on to say that some combat forces were not Grenadian but “led” by “senior” Cubans, who had been captured. The two went on to discuss the Caribbean backers of the US forced landing. President Reagan had the support of the leaders of Jamaica, Dominica and Barbados for the operation. In their phone conversation, Mrs Thatcher described then Dominican Prime Minister Eugenia Charles as “a wonderful person”. In response, President Reagan said: “She certainly is. She’s captured our city by storm. She’s right up on the Hill meeting with some of our Congress right now. Mrs Thatcher then went on to describe Barbados’ Prime Minister Tom Adams as “a very cultured man and very wise”. 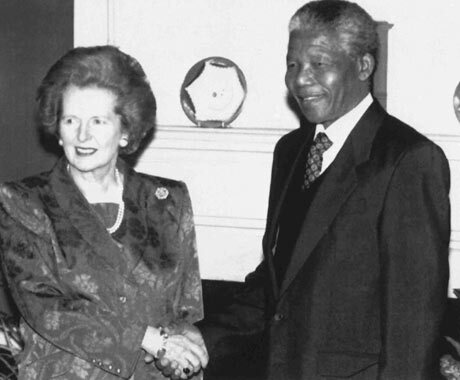 However, according to Richard Aldous, the author of Reagan and Thatcher: The Difficult Relationship, she later told the Irish premier: “The Americans are worse than the Soviets… persuading the governor [of Grenada] to issue a retrospective invitation to invade after they had taken him aboard an American warship. Mrs Thatcher is also famously remembered in the Caribbean for her clash with the rest of the Commonwealth over full sanctions against the apartheid regime in South Africa. In 1985, then Commonwealth Secretary-General Shridath Ramphal of Guyana had called for sanctions. The British Prime Minister stood against the majority of her fellow Commonwealth leaders, saying that full sanctions would not work. Her view of sanctions as an attack on free trade and against Britain’s economic interests have been closely documented by the British and African media. She agreed to limited sanctions at a Commonwealth meeting in Nassau in 1985 and continued to hold out against full sanctions. When questioned at a news conference in Australia about being one against 48 in the Commonwealth on the issue, Mrs Thatcher responded in characteristic fashion. ”When it is one against 48, I’m very sorry for the other 48,” she said. But her pugnacious style eventually proved her undoing when it became clear in 1990 that she no longer had the backing of her own cabinet.